It is always nice to read an article that encompasses more than one of my hobbies, whether it be amateur radio and amateur astronomy like this one, amateur radio and model rocketry, or amateur radio and radio controlled airplanes. I don't recall ever seeing an article that combined astronomy and model airplanes. In this QST piece, author Hollis French expounds on the necessity for Hams to understand the effects that atmospheric phenomena, caused primarily by our sun's periodic and intermittent activity, have on radio signal propagation. Properties of the ionospheric layers had by 1943 been pretty well surmised based on cause and effect relationships through indirect observation since at the time no sounding rockets had been launched into the upper atmosphere to obtain in situ measurements of ionization, magnetic fields, and free electron activity. Today's knowledge of course is much more detailed and formulated thanks in large part to amateur operators over the succeeding decades. A contemporary analogy would be comparing what we knew about the surface of Pluto before and after the New Horizons probe last July. Radio development has entered a stage in which the amateur experimenter of necessity must become an amateur in other vitally related earth and sky sciences. He must learn to understand and use new tools and apparatus in order to make the most effective use of the very-high and higher frequencies. The factors which govern weather and the electromagnetic field of the earth -astronomical, meteorological and topographical - as well as conditions in the ionosphere and in the upper and lower troposphere all serve to determine the range of communications just as definitely as do power input, circuit efficiency or mechanical design of transmitting and receiving components. After the last war, the radio amateur conquered the oceans; after this war, he will explore and master the "ocean of air" in which so much of our power was wasted in other years. Now, while wartime restrictions hold ordinary "hamming" in abeyance, is the time to study the science" of astronomy and aërology for their bearing upon communications. Radio is not strictly a terrestrial art. With advancing knowledge, ever closer relations appear between the science of astronomy and the art of radio communication. These are more evident as we pass the limitations of the old astronomy of position and enter the fascinating field of astrophysics, where radiation becomes the foundation of the science. Leaders in the field of research, such as the Radiation Laboratory of the Massachusetts Institute of Technology, today employ astronomers and radio engineers alike among their physicists engaged in the investigation of the general field of radiation and its manifold applications to the service of man. In many projects, the astronomer and the radio engineer must work closely on the same problem. In the study of the propagation of waves, for instance, we find ourselves in a field where a thorough understanding of astrophysics is required to understand observed effects. The sun is a star, and certain aspects of the behavior of radio waves in the earth's ionosphere are functions of activities taking place within and upon the surface of this star. The earth's satellite moon likewise has been accused of complicity in the changing patterns of wave propagation. We may well disregard "signals from Mars" or hypothetical influences reaching us from distant stars, but the amateur will be better informed about where his signals are going, and why, if he is willing to look into a few topics of practical astronomy. We leave for treatment in a later article ·the influences of the sun upon radio transmissions in the very-high, ultrahigh and super-high frequencies through variations in temperature, humidity and gradients of pressure in the lower atmosphere. The resulting discontinuities between adjacent air masses are potent factors governing communications, but their discussion properly belongs in the science of aerology rather than astronomy. The tidal or gravitational effects of both sun and moon may be considered as belonging to either science or both. We examine first, therefore, the direct influences of solar radiation upon the earth's ionosphere. There are daily, seasonal and long-period variations of a cyclic nature which affect distant reception of all radio frequencies and which are directly attributable to solar radiation. The more familiar of these phenomena are the daylight-to-dark shifts of transmitting range and the summer-to-winter variations. 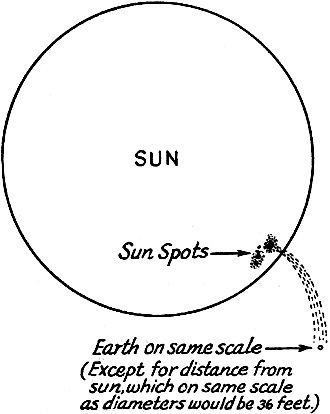 Both of these effects we understand to be related to the position of the sun with respect to the observer's horizon. Similar effects, differing from the solar influences in degree and in period, have been traced by H. T. Stetson1 to the position of the moon in the observer's sky. One explanation of these phenomena postulates electrostatic fields for sun, moon and earth, with interaction governed by mutual potential differences. A proved hypothesis applying only to solar influences is that of the ionization of distinct atmospheric layers of differing densities. Many radio amateurs, like the late Ross A. Hull, have included amateur astronomy in their hobby interests. This article points out ways in which astronomy serves the advancement of radio. Succeeding articles on "Aërology and V.H.F. Wave Propagation" and "The Influence of Topography on V.H.F.-to-S.H.F. Communications " will further demonstrate the importance of a knowledge of these related sciences to the radio communications art, and will discuss the construction and use of instruments for research and experiment such as the barometer, psychrometer, anemometer, resistance-type thermometer and hygrometer, recording devices, the pilot balloon and all the interesting "radiosonde" gear used in soundings of the lower atmosphere. Other new tools which will be suggested for the radio amateurs use include contour maps, the level and theodolite - all strange gadgets to practitioners of the mike and key, perhaps, but definitely useful in adapting ourselves to present-day and probable future developments in amateur communications. We may consider the sun to be an enormous transmitter, with self-contained power supply, which radiates energy over a broad band of wavelengths of an order of magnitude so small that, instead of measuring them in meters and centimeters as we do radio waves, a special unit called the angstrom is applied. This unit has a value of about one ten-millionth of a millimeter. The solar band of wavelengths includes heat rays, light rays, ultraviolet rays, X-rays, gamma rays, and other rays of yet shorter wavelengths, some of which are of lethal character. Fortunately for life upon the earth, rays shorter than about 2900 angstroms are filtered out before reaching the surface of the earth by a transformation in the upper atmosphere brought about by the ultraviolet portion of the sun's radiation. This upper region, called the ionosphere, lies between 30 and 250 or more miles above the surface of the earth - above both the troposphere, or lower atmosphere, and the stratosphere. Here the separation between atoms is so great and collisions between them so much rarer than in the denser lower atmosphere that, when an atom becomes ionized by being robbed of one or more of its electrons by the action of the ultraviolet rays, it remains in that condition for a relatively long time. Thus we have an ionized region of a composition so different from that of the lower atmosphere that radio waves are refracted differently. Moreover, there are in the ionosphere itself strata of differing densities, and therefore of differing indices of refraction, which constitute a distinct series of layers. This region has been investigated and, for convenience in comparison, the different layers have been labeled D, E, F, F1 and F2, according to their relative average heights above the surface of the earth. (See Fig. 2.) None of these layers remain constant in height, and it is the variation in their heights, combined with their various refracting, reflecting and absorbing capabilities, that govern to a very large extent the conditions of long-distance radio transmissions. The heights of the ionized strata and the degree of ionization may vary in accordance with the angle of incidence of the solar rays and also in accordance with changing conditions within the sun, which affect the character and amount of its radiation. Diurnal and seasonal variations arise from the first cause, longer-term cyclic and sporadic variations from the latter. Fig. 1 - Relative size of sun, earth and sunspots. A stream of intensified radiation originating in a region of sun-spot disturbance traces a curved path through space by reason of the rotation of the sun combined with the decreasing velocity of the stream beyond its point of origin. When all or e factors involved are better known and understood, it should be possible to make reasonably precise predictions of coming change wave-propagation conditions caused by various forms of solar radiation. Two cycles, in addition to those of diurnal and seasonal variations, now are recognized. One of these - the solar rotational cycle, of approximately 27 days - marks the average time between reappearances of the same sunspot group at the central meridian of the sun. The approximate time definition arises from the fact that the substance of the sun is gaseous and, therefore, a spot on its surface will not necessarily rotate at a constant rate. The rotation period at the solar equator is approximately 24.6 days, and this period increases with rising latitude. The principal appearances of the disturbances known as sunspots are between solar latitudes 5° and 40°, and the mean rotational period of this belt is approxi­mately 27 days. Quantitative measurements of the effects of solar radiation upon the medium frequencies were commenced by Dr. G. W. Pickard as early as 1926.4 Correlation of these measurements with the sunspot numbers on the Wolfer scale was continued by Professor Harlan True Stetson, Director of the Perkins Observatory (astronomical) and Professor G. W. Kenrick of Tufts College Electrical Laboratories.5 Sporadic effects of solar eruptions, resulting in "fade-outs" on the high frequencies, were investigated by Dr. J. H. Dellinger of the National Bureau of Standards.6 J. A. Pierce, W1JFO, and Melvin S. Wilson, W1DEI, among others, have published summaries of observations of solar radiation effects upon the lower portion of the very-high-frequency range.7 By means of these, numbers of amateurs, otherwise innocent of any knowledge of astro-physics, have become familiar with such terms as "Dellinger effect," "skip distance," "critical frequencies," "virtual height," "aurora skip" and "sporadic E-layer skip." Many amateurs undoubtedly will be quite content to accept, at second-hand, any astro-physical data relative to their hobby. For those who have a mind to investigate these things for themselves, to seek out first causes and perhaps to reach a position where they may be able to make further contributions to the field of knowledge, there are excellent textbooks on astronomy, such as the two-volume edition of "Astronomy" by Russell, Dugan and Stewart of Princeton University Observatory, as well as practical manuals on the construction of observational gear. One of the best of these is Ingalls' "Amateur Telescope Making"; another is George Ellery Hale's "Signals from the Stars," in which he describes a complete solar telescope and spectrohelioscope of an inexpensive type which, as he says, "can be built and used by professional or amateur astronomers and geophysicists and by radio students interested in the possible influence of solar eruptions on radio transmission." Fig. 2 - The difficulty man faces in plumbing the vast depths of the "ocean of air" is indicated by the scale of this drawing, if the reader remembers that there is yet more beyond. The drawing attempts to include as many points of information as possible, scaled against the indicated heights above sea level. The division by dotted lines roughly separates the horizontally homogeneous regions of upper and lower atmosphere (not to be confused with the layers of intensified ionization, not all of which are shown). Soundings of the ionosphere have been possible only through spectroscopy and the reflections of high-frequency radio waves. The amateur with a truly scientific approach to his hobby will study all available sources of reliable information and ground himself thoroughly in the proved fundamental principles of every field of knowledge having a bearing upon his own research. He will patiently test each new theory by known facts. He will carefully record the results of all observations for further study, comparing, analyzing, separating the unknown factors, and testing over and over again. A relevant fact omitted may destroy the opportunity for a real contribution to the development of the art. The science of radio communications unfortunately has been afflicted with a lunatic fringe spun from pseudo-scientific hypotheses comparable to the claims of astrology in the field of astronomy. Some years ago a "research" article was published in a popular radio magazine in which the author proposed a lunar theory affecting 5-meter DX which, in substance, suggested that the moon exerts a tidal effect upon the earth's atmosphere, as well as upon the earth and the sea, and that the resulting distortion of the atmospheric layers accounted for periodic increases in the range of propagation for 56-Mc. waves. This author counseled his readers therefore to "watch the periods of time between three and four days before and three and four days after full moon for long-distance DX (sic) on 5 meters this summer." What is wrong with this picture? "A little knowledge is a dangerous thing." The gravitational pull of the sun and moon undoubtedly do create atmospheric tides and it is conceivable that herein may lie the explanation for one of the many ways in which the propagation of electromagnetic waves is affected, although the magnitude of increases in effective transmitting distance from such a cause is probably so slight as to be difficult of measurement. However, the theorist obviously was innocent of knowledge of the simplest astronomical principles to a degree that enabled him to ignore established facts. If such an effect is caused at full moon by the alignment of earth, sun and moon, the tidal effect is even more marked at the time of new moon, and more still at the periods when either new moon or full moon happens to coincide with the time of the moon's perigee (moon's closest approach to the earth). Nevertheless, this lame lunar theory was widely accepted in the five-meter fraternity, and many a voice was heard on the air passing it along as the latest and most scientific explanation for the mysteries of five-meter DX. The keenest enjoyment of his bobby is experienced by the amateur when his progress in the art is by means of his own careful study and research, rather than by a process of thumbing rides on the vehicles constructed by other minds. 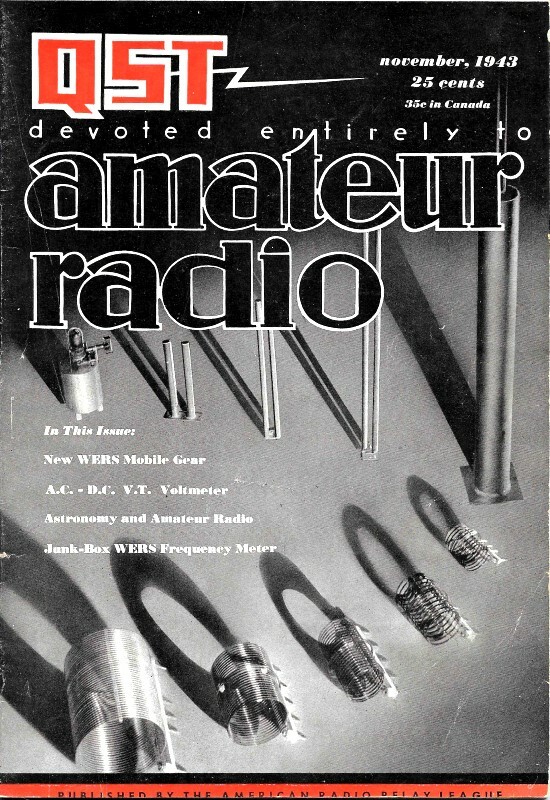 It is with the purpose of encouraging the thoughtful and scientifically minded amateur that these articles are offered on topics which may at first glance seem to some to be but slightly related to amateur radio as they have known it. Among the stranger people on this earth are radiomen. A radioman is a person either going on or coming off watch. Contrary to popular belief, radiomen are not crazy. A radioman has two brains: one perfectly normal brain, which is destroyed during the process of learning radio, and another which is ill a constant state of turmoil and is used proficiently in his work. This latter brain is filled with dots and dashes and procedure signs. Radiomen are like groundhogs. They seldom see the sun, coming up topside only on Saturday mornings at the special request of the commanding officer. If the sun is shining and a radioman sees his shadow, he goes below and everyone knows there will be six more days. Sitting at his typewriter a radioman receives an endless story of the world flowing through his ears, unable to get out because both ears are stopped up by headphones. The stuff flows out through his fingers and is given out as press news, weather messages, and so forth. When conversing with a radioman, do not try to point your story by asking if he remembers "the message to Garcia," because he will jump and scream, "What's the number of it? Who sent it? If it's lost, it didn't come in on my watch!" Radiomen live on black coffee and cigarettes" All through the long midnight watches they sit and dit and dah, so tired and weary of it all and wondering why they ever chose radio as a profession. When they go off duty they hurry home to their little "ham" radio sets and just dit and dah to their heart's content. Girls who fall for radiomen will find they are courted with considerable sparking, and after they are married will receive much broadcasting both loud and long. Radiomen are found on all ships and in all stations and are quite harmless if left alone, fed occasionally, and given annual leave so they may rig up new "ham" outfits at home! * Asst. Technical Editor, QST. 1 H. T. Stetson, "On the Correlation of Radio Reception with the Moon's Position in the Observer's Sky," Perkins Observatory Miscellaneous Scientific Papers, Reprint No.8, about 1932. 2 "Getting the Signal Across," (by six engineers of RCA Communications, Inc.) Relay, Sept. 1943. 3 J. H. Dellinger, "Some Contributions of Radio to Other Sciences," reprinted from the Journal of the Franklin Institute, Vol. 228, No. I, July, 1939. 4 G. W. Pickard, "Correlation of Radio Reception with Solar Activity and Terrestrial Magnetism," Proceedings of the I.R.E., Vol. 15, 1927, Nos. 2 and 9. 5 H. T. Stetson, "Radio Reception and the Sunspot Cycle," reprint from the Proceedings of the Fifth Pacific Science Congress, Toronto, 1934. 6 J. H. Dellinger, "A New Cosmic Phenomenon." QST, Jan. 1936; "High-Frequency Radio Fadeouts Continue," QST, June 1936; "Radio Fadeouts Through 1936," QST. Feb. 1937. 7 J. A. Pierce, "Interpreting 1938's 56-Megacycle DX." QST, Sept. 1938; M. S. Wilson, "Five-Meter Wave Paths," QST, August and September, 1941.